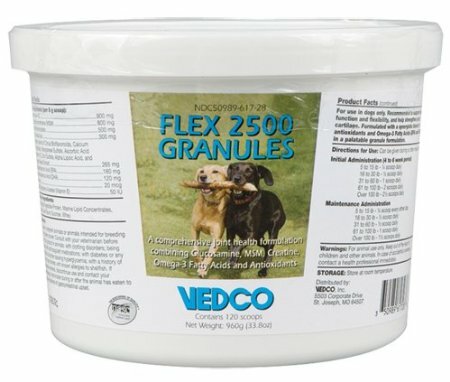 Flex 2500 Granules, 960 gm contains glucosamine, MSM, perna canaliculus, and omega-3 fatty acids. Easy-to-administer granules also have creatine monohydrate which helps enhance the energy for muscle contraction. Flex 2500 works by lubricating joints, restoring viscosity to synovial fluid, and easing pain and discomfort. Initial administration (4 to 6 week period): 5 to 15 lbs - 1/4 scoop daily, 16 to 30 lbs - 1/2 scoop daily, 31 to 60 lbs - 1 scoop daily, 61 to 100 lbs - 2 scoops daily, Over 100 lbs - 2 1/2 scoops daily. Maintenance administration: 5 to 15 lbs - 1/4 scoop every other day, 16 to 30 lbs - 1/4 scoop daily, 31 to 60 lbs - 1/2 scoop daily, 61 to 100 lbs - 1 scoop daily, Over 100 lbs - 1 1/2 scoops daily.